I was sitting at my wooden desk when my 4th grade English teacher began walking around the room handing out graded homework. Miss Benson was younger looking than some of the other teachers, tall and lean like a pencil but not stiff. Her eyes always seemed safe and kind to me, even behind dark framed glasses that matched her shoulder-length brown hair. Maybe because I wore glasses I was assigned a desk closer to the windows, two rows or so back from the blackboard and a row or two left of center. In a class of perhaps 25 students and with no teacher aide to help out, that should give you some idea I had been waiting a while for her to get over to me. I can imagine I was feeling a similar nervous anticipation as those of other classmates while we waited for our white sheet of paper, hoping for a good grade, or for some slower learners their wish for at least a passing one. Those were tense moments at school, about as uncomfortable as the gym line was while waiting to see how many other kids were going to be picked for a team before you heard your name called. I say I can imagine because I do not recall heart-throbbing doubt as Miss Benson made her way up and down the rows of desks. The reason for that is likely because of what happened next. On came the surge of happy feelings. Being liked by my teachers was important to me and I was confident Miss Benson liked me. But this felt better than being liked. She was seeing me as being good in a way I did not even know could matter. 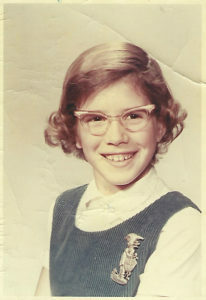 Having friends, being chosen to wear the hall monitor badge for a week because of my aptitude for responsibility, knowing the correct answers while taking a test or whenever called on, being neat, not being clumsy – those things, not being a good writer, are what dominated my 4th grade mind. As a young girl I liked writing a story way more than getting up in front of others to tell one, as was sometimes required, and it was more fun than memorizing multiplication tables. What I especially liked were the images I thought about when I was writing. Because my cursive penmanship was even and fluid it made the pictures I put to paper appear to come through me without much effort. It was a bonus that I liked the powdery sensation of the pencil’s drag as the lead marked the lined composition paper. The joy of that sensation was itself an encouragement to finish math homework or repeat the same letters in lower and uppercase till the page was filled. Fortunately, I found this to be a consistent tactile delight, independent of whether or not I had paper of finer quality. I liked the firm feel of the pencil in my right hand, way more than the feel of the cello between my skinny legs. That felt about as wrong as holding a fork in my left hand. A pencil in my right hand was natural, as if it were just another one of my unusually long, slender fingers. With hands like mine I grew accustomed to being asked if I played the piano. My answer has always been No, but now if asked I would say my desktop keyboard is the only instrument I ever cared about enough to be willing to put in hours of practice. Which is what it took to develop control over that number 2 point. I did not know in elementary school what it meant to be a good writer to someone else, much less the meaning of having a career. I have no memory of asking Miss Benson anything about that as it didn’t matter to me just then. All I had been taught to care about was the red A. That day hearing praise from a teacher I especially liked felt as if I had actually earned the elusive A+. More than simply pointing out an ability that could benefit me as a grownup, the encouragement was validation that what I enjoyed doing was actually worthwhile. But possessing a desire to master something as difficult as writing would mean I would have to learn to value my own opinion and effort, particularly on days when there was not much to show for my time. Had I known this as a child, and how many fits and starts and edits and rewrites there would be, it is possible I might have been too intimidated to attempt to become good enough at writing to earn a living. When the inclination to pursue the craft grew stronger I sought advice from successful adults and professionals. Sometimes I would find that not everything I heard or read applied to my personality or the vision I had for the future I wanted. I learned to take in what made sense to me and tried to adapt whatever applied to my circumstance. I did observe a characteristic trait in those who sought more than money as the metric for their life’s work: their commitment to serious discipline. This trait was more visible to me than what sacrifices they had made in order to reach their particular rung on the professional ladder. If you know anything about the art of baking or cooking and the secret sauce of success, being disciplined is one ingredient where there is no equivalent substitute. Why is this? To develop discipline is ultimately about strengthening one’s will to be able to focus so distractions become less attractive. As the rewards of focus blossom, it is not as great a struggle to resist being distracted or disengaged. It doesn’t mean they entirely disappear, but rather a strong will power just makes it easier to sustain focus whenever energy, interest or a belief in oneself lags or doubts and insecurity creep in. Those need to be seen as temporary, imaginary mood monsters that have no real bite. A perennial wisdom is that the cornerstone for constructing a career or a body of work — one’s oeuvre — requires practice, discipline and focus. Oeuvres do not necessarily require sustaining an equal degree of desire or pleasure, but if those are insufficient you may find the inclination to continue enduring the sacrifices may diminish and thereby delay, if not sabotage, success. Discipline that in one moment feels like a grind can suddenly morph back into an exercise with benefits. Being consumed with disciplined practice, if it puts order to chaos, can also be energizing. What I eventually discovered is that what seemed to matter most was not how much I produced or what anyone else thought of my writing, but rather what I felt about myself while I was doing the work. Writing, more than any other creative outlet, turned out to be the comb I used to straighten out tangles of thoughts or emotions, trying to make things beautifully whole. Once I got a little better at it, the act of writing widened my world of wonder, beauty, and mystery. Over time the effect of building a body of work is similar to what happens, for example, while working on picture puzzles or sudoku. Gradually the image or answer becomes more apparent, clearer, obvious, complete and fulfilling and that’s the point at which it’s time to work at a more challenging level. Another option is to switch to responsibilities that may be tangentially related or that may be in different fields of interest. A life oeuvre is about continuing to expand the horizon of knowledge, skill and contribution beyond the previous boundaries, and attaining functional wisdom. The arc of any profession is generally viewed by starting at the pinnacle of accomplishment with hierarchical labels that define the goal or position or elevates performance to career status, i.e. 5-Star General, Surgeon, Professor. But whether or not one becomes gainfully employed, most everyone at one time or another will begin with a basic practice of service to someone other than themselves. A life’s oeuvre is the tally of that principle. That makes categorizing contributions of any work through just the lens of the career label a diminishment of what has been learned and practiced but not always visible or tangible to others. Because the greatest personal growth and satisfaction is acquired through the use of what is applied, not just learned, it is valuable to look at one’s practice as a step toward a grander role. Rather than only seeking the traditional expectations from a career, use each job as a means to a greater end: for accumulating wisdom. This is a minor shift in perspective and involves working at cultivating a conscious awareness, one that orients one’s intention toward embracing each day’s tasks or challenges rather than resisting them. Every life experience contains the potential of being incorporated into one’s oeuvre, whether it be through one’s employment or in the labors of love. This intention can be applied to employment, personal time, relationships or even with aging. For example, should an annual physical result in a diagnosis of a serious health condition, perhaps one that is life threatening, consider 1) being oriented to seeking information 2) working a virtuous practice (such as patience for recovery) and 3) welcome the opportunity for a joyful discovery of new friendships. Doing that can elevate pretty much any challenging, frightening experience or a new phase of life, enriching it with the wisdom of exquisite possibility, meaning and hope. Now that I have time-traveled several decades, living out the fulfillment of seeing my byline on countless columns and my books on store shelves, if pressed for a list of people whose memory is a blessing, I include Miss Benson. She turned out to be my earliest professional counselor. Who is your earliest mentor or inspiration? Are you that person for someone now? Giselle M. Massi is a former journalist with The Denver Post and author of “We are Here for a Purpose: How to Find Yours” and the novel “Just Dance the Steps.” To read more or to contact Giselle, go to www.gisellemassi.com.